Feature: Is It Sustainable To Mine Gold In This Current Price Environment? (Kitco News) - After seeing gold prices plummet in 2013 and with gold miners battling high operating costs, gold companies find themselves with razor thin profit margins with the ounces they’re pulling out of the ground. The cost to mine and produce an ounce of gold, on average, ranges from $1,100 to $1,250.. Some mines produce gold at a very affordable cost while others are now producing gold at costs that are higher than the metal is valued. As gold rose to over $1,900 an ounce in the fall of 2011, the general thought process that accompanied the rise was that gold miners were reaping enormous profit margins. This information was provided to Kitco News by a mining company that wished to remain anonymous. 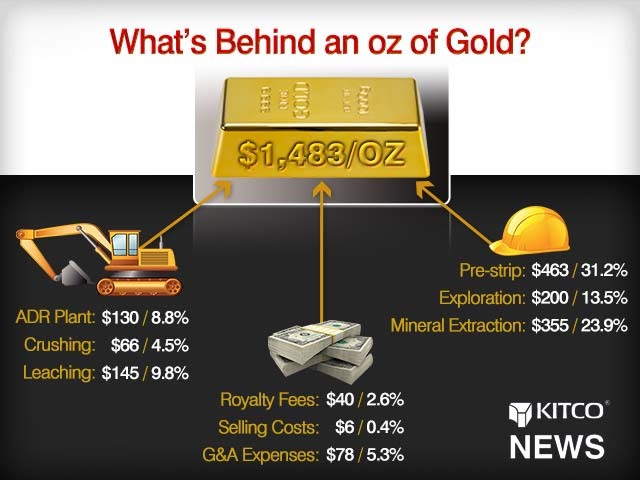 It shows a breakdown of its current costs and how mining an ounce of gold is costing them about 1,483/oz. Not so, said Peter Gray, managing director of Headwaters MB, a US-based investment bank. “Everyone thought at $1,600, $1,800 and $1,900 gold (that) all the mining companies were making profit hand over fist, but, the reality is that the capital costs of construction had escalated so significantly that the margins of production and the margin of operation were still tight,” Gray said. On Friday April 12 and Monday April 15, gold suffered its biggest drop in 33 years plummeting over $200 an ounce in two sessions. As of press time, spot gold was currently trading at 1389.60. “You’ve got to look at it a mine-by-mine, company-by-company basis,” said Brent Cook, geologist, and founder of the mining newsletter, Exploration Insights. “At $1,300 gold, there are a lot of mines that are cash flow positive and if you just burn those out, things should be fine. There is no concrete all-in cost figure that covers mining an ounce of gold in the mining industry as some companies report all-in sustaining costs and others report a less complete cash cost. Goldcorp Inc. (TSX: G)(NYSE: GG), a leading global gold producer, is one of the companies that report all-in sustaining costs per ounce. Citing the company’s 2013 first-quarter results, all-in sustaining cash costs totaled $1,135 per ounce. The all-in sustaining cost metric is a tool for measuring the actual cost to mine an ounce of gold and is being ushered into the gold mining industry. “The all-in sustaining costs was well received by the seniors because it demonstrates that we’ve been trying to show different stakeholders that our cost is not just taking the material out of the ground, it’s much more than that,” said Brent Bergeron, senior vice president of corporate affairs for Goldcorp. “We’ve been pushing this initiative through the World Gold Council and most of the members that are there are the seniors, so, you will get a lot of them saying that it is important, because we believe over the long run that is the most important figure that you can give. “I think it’ll get much traction from the seniors, not quite sure that juniors will get there yet,” Bergeron said. There is a necessity for mining companies to show the actual all-in cost that goes with mining an ounce of gold given the current state of the mining industry. The general rallying cry of late for mining companies has been a ‘Back to Basics’ approach with a particular focus on cutting costs. After 2013’s first-quarter earnings were filed by gold miners in April and May, the message was loud and clear; costs need to be cut. “They’re cutting costs everywhere they can; capital expenditure, exploration, development, everything because they’re trying to tweak their mines to get a little more blood out of the rock, if you will,” Cook said. While gold mining companies have been applying cost cutting measures, another serious dip in gold prices could border catastrophic for companies with mines flirting with tight, or no margins at all. CPM Group, a New York-based commodities research firm, said gold prices could drop to as low as $1,260 if support at the $1,340 level is breached. Rohit Savant, senior commodity analyst for CPM Group, believes that while gold could test those levels, he doesn’t expect gold miners to hit the panic button immediately. “If the price of gold goes down to $1,280 or $1,260, which is a possibility, that’s not something that would affect supply so much,” Savant said. “It would make mining companies think about the cost, which they should be thinking about anyways at these current price levels. It really depends on how long it would stay there. While the steep fall for miners has been watched closely and picked apart by analysts and media alike, it’s not all doom and gloom said Peter Gray. Gray suggests that now is the time for major gold producers to start acquiring strong junior and intermediate gold miners, companies that have strong projects and have already spent capital to get their operation going. Brent Cook also sees the need for an upswing in mergers and acquisitions for gold producers. Bergeron said that strategies vary from company-to-company and that, essentially, gold mining companies that had a structured, disciplined strategy during the days of $1,900 gold are not suffering as much in this current price environment. “There will be fluctuations and I think it depends on what kind of strategies that companies actually take,” Bergeron said. “And also the reaction from the market seeing what companies are trying to do; not growing with size but with quality,” he added. Cook and Savant echoed Goldcorp’s approach to quality over quantity as a necessity for gold miners to maximize cash flow. Unfortunately for the mining sector, the winds of change towards the positive are not yet in sight. “I think we’ve got a long bottoming process here,” Cook said. “On the positive side this is the opportunity because we know in a year, or two years from now, that all the mining companies are going to wake up and realize their mines are dying. “It’s a great time to start leveraging into the few great projects out there that I think make good money,” he said.